Esquire Titling is a vehicle registration service licensed and bonded by the Department of Motor Vehicles to provide DMV paperwork processing to new and used automobile dealers, wholesalers, and manufacturers in California. Many services are also available to the general public. Using a Registration Service will save dealers money, reduce their legal liability, and help keep their dealer license in good standing. Esquire Titling has twenty years of experience and the expertise to competently handle even the most complicated paperwork. Additional services include Electronic Vehicle Registration (EVR), communication with customers and finance companies regarding the status of their titles, bundle reconciliation reports, dealer "heat sheets" showing outstanding items, fluency in Spanish, an on-staff vehicle verifier, and free legal consultations with the owner, who is an attorney. Esquire Titling offers the most competitive prices in the industry. Join the more than one hundred and fifty dealers who have trusted Esquire Titling to meet all of their DMV needs with fast, accurate, reliable DMV processing. NOTICE TO CUSTOMERS: Esquire Titling is licensed to provide vehicle registration services to the public, but is NOT a branch of the Department of Motor Vehicles. 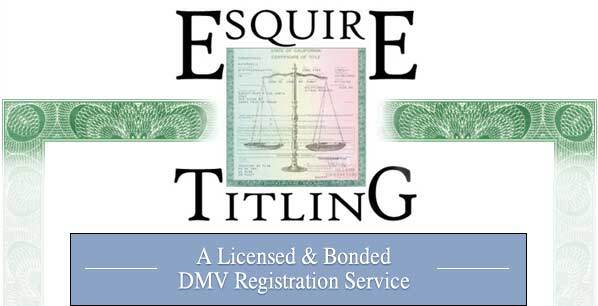 Esquire Titling has no official connection with the DMV other than as a licensee. Many of the services for which Esquire Titling charges may be obtained at no charge by visiting a DMV office.